A unique set limited to 500 pieces only. 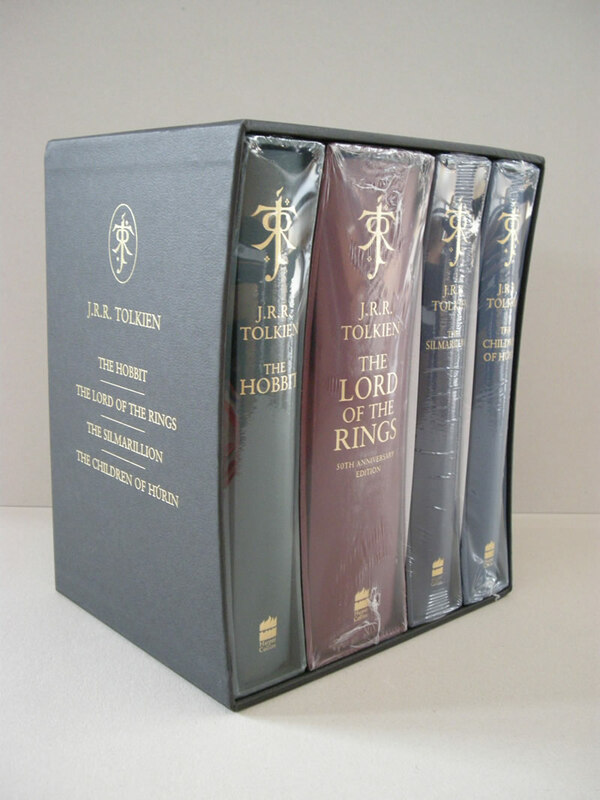 Previously not available to US customers, but now available through the Tolkien Library Store - we will ship this set worldwide! 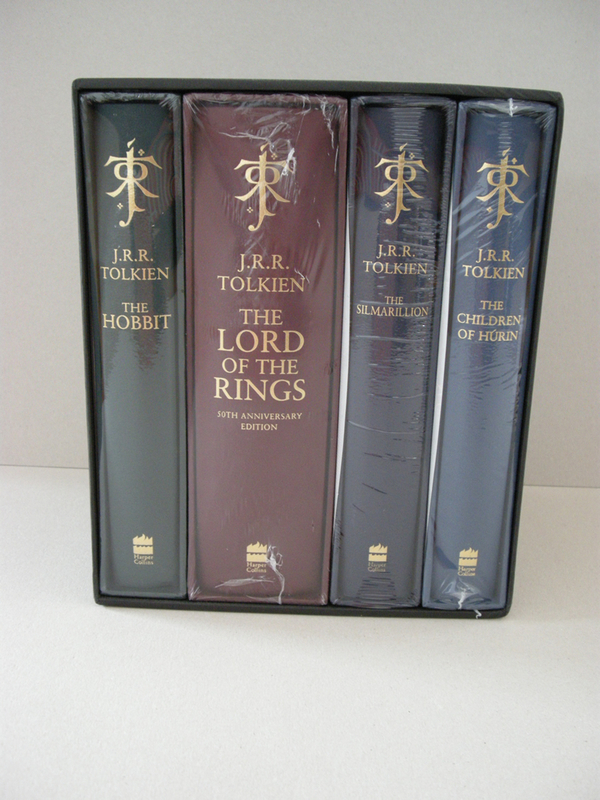 A unique set of never-before-collected deluxe editions in original publishers slipcase. Limited to 500 pieces only. 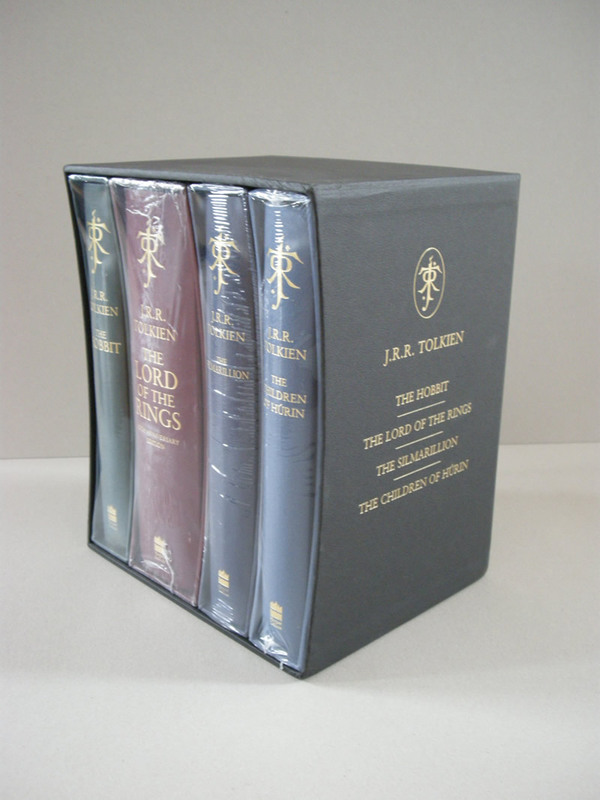 Previously not available to US customers, but now available through the Tolkien Library Store - we will ship this set worldwide! Since the 50th anniversary of The Lord of the Rings in 2004, HarperCollins has published a series of new deluxe editions of the principal Tolkien works. The series is completed in November this year with the release of The Silmarillion to commemorate the 30th anniversary of that book's original publication. For the first time ever, you can buy the complete collection of four books as a set. Features Tolkien's drawing of the dragon Smaug embossed in gold and red foil on the case. This is the only edition of The Hobbit to feature all 13 of Tolkien's own illustrations for the book reproduced in full colour, together with his original maps reproduced as he originally intended but not previously achieved in nearly 70 years. 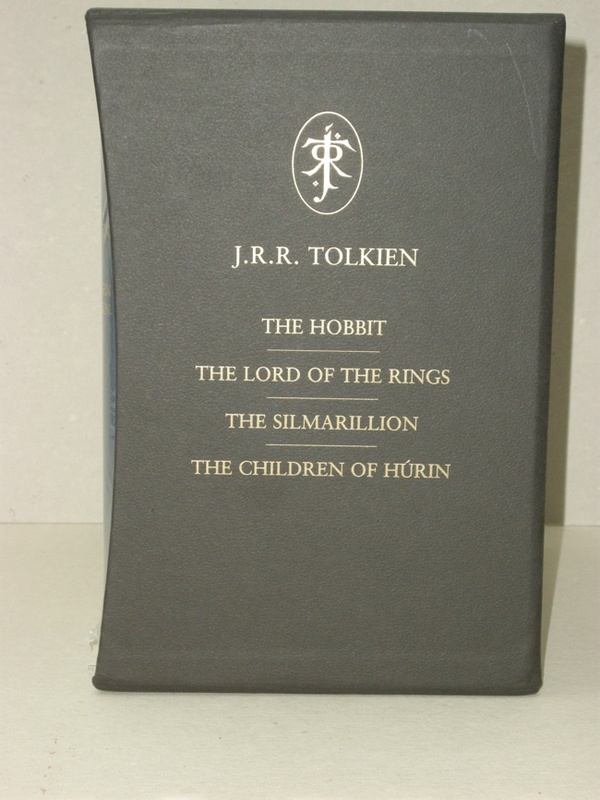 This 50th anniversary edition is embossed with Tolkien's "Eye of Sauron" design in two foils and features for the very first time the pages from the Book of Mazarbul, illustrations done by Tolkien and intended for inclusion in the famous "Bridge of Khazad-dum" chapter but previously never used. Also appearing are previously unpublished family trees and the two original fold-out maps by Christopher Tolkien. For this edition and for The Hobbit, the text was checked by Tolkien experts against the original first editions and manuscripts, and more than 400 corrections were made to make this the most accurate and definitive version ever published. 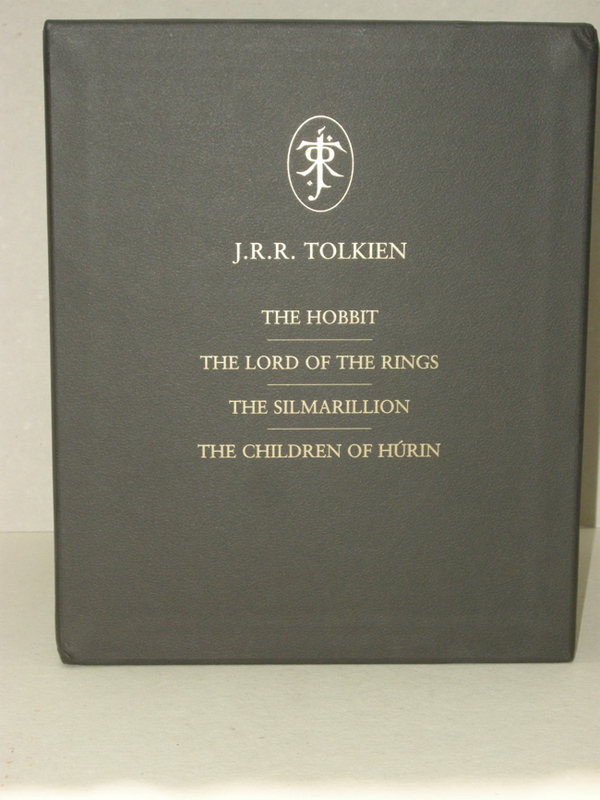 Matching The Hobbit and The Lord of the Rings, this first edition deluxe printing of The Children of Hurin includes a ninth colour plate by Alan Lee not featured inside the standard hardback, with Hurin 's golden helm designed by Alan Lee embossed on the cover. Published for its 30th anniversary, this newly reset edition of Tolkien's masterwork The Silmarillion features an exclusive full colour frontispiece The Halls of Manwë painted by J.R.R. Tolkien, the only scene from the book he painted, and is embossed with the delicate heraldic symbol he designed to represent Luthien, The Silmarillion's greatest heroine, which is also reproduced inside the book in colour. This edition also includes Christopher Tolkien's two-colour maps, including a fold-out map of Beleriand, and as a Preface, Tolkien's original letter of 1951containing his account of the mythology of Middle-earth. This edition was available for a limited time only. Still sealed in the factory plastic wrap, the photos were taken of an opened copy.